This unique recipe gives the typical quesadilla a Middle Eastern twist. It’s delicious for breakfast any time of the year. You can substitute other seasonal fruit or jam, such as plums, raspberries, or peaches. Note: Children should use plastic or table knives for all child steps that require cutting or chopping. Child Place 2 tortillas on a clean table or cutting board. 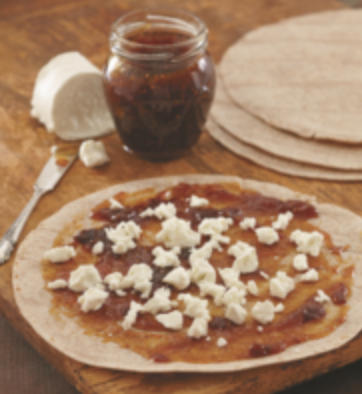 Child Spread fig jam over the tortillas in a thin, even layer. Adult & Child Distribute chunks of goat cheese evenly over the fruit. Place the remaining 2 tortillas on top and press down firmly. Adult Use a spatula to transfer each cooked quesadilla to a plate and cover with foil to keep warm.